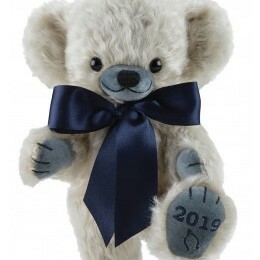 Cheeky Year Bear, classically designed as a high quality memento of 2019. Made of mohair each limited edition bear features the famous Merrythought wishbone motif, and ‘2019’, embroidered onto the left foot. The ‘Midnight Blue’ embroidery works beautifully with blue-grey velvet paws, and a matching rich satin ribbon to finish. Partly pellet-filled.